Simple Sweeping… Hand-pushed sweeping machine – Ten times quicker than a dustpan and brush! Clean working method and large area performance, time and again. 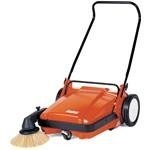 Machine suitable for daily, industrial use – for both indoor and outdoor cleaning. Clean working method for both fine dust and larger dirt particles as a result of special twin bristles.